I ended yesterday with zero words written for the day. I had a full day away from home and I just didn’t have the energy to get started. 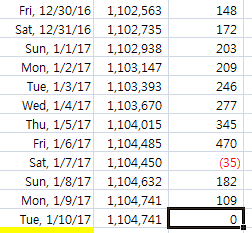 I actually consciously looked at my writing streak in my daily word count log, said, “Neh,” and closed the computer. Wondering what that big number is in the image? That’s my cumulative word count since I started tracking in 2012. Anyway, on to make today the beginning of a new streak. I both want and need to make some significant progress today on this book I’m working on. Today is the first day this year that both of my kids are back in school. I have no reason to put off getting back into this book and fixing the problems it’s giving me. I’m ready.